Mae Khong River is a newcomer to the Victoria Street Thai scene having only opened about month ago, however I am very confident they will make a big impact. 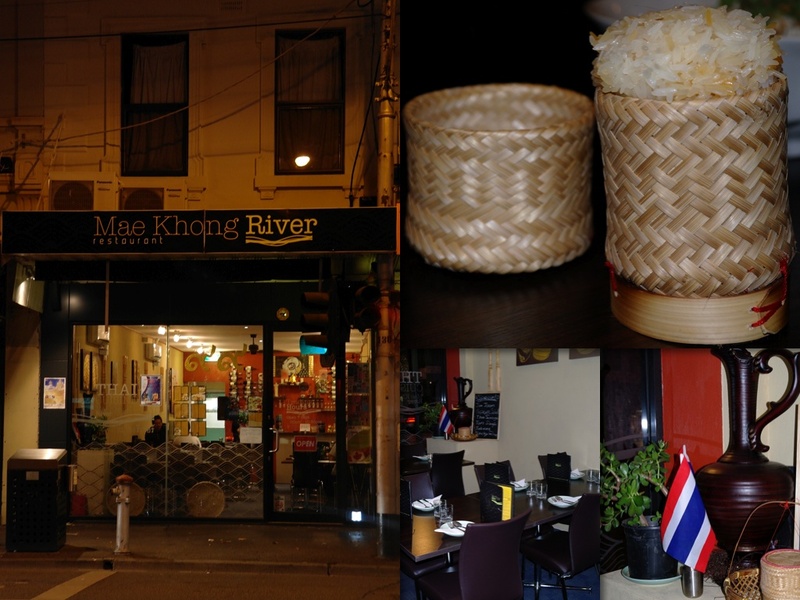 Mae Khong is possibly suffering a bit of an identity crisis due to the similar named CBD Vietnamese restaurant Pho Bo Ga Mekong (Bill Clinton had two bowls). The Mae Khong river is associated with Vietnam by most people however it actually originates in Tibet and flows though China, Burma, Laos, Thailand, Cambodia and Vietnam. The northern Thai have a special affinity with the Mae Khong river and affectionately refer to it as Mother Khong. The section of the river that flows though Thailand is also famous for a natural annual phenomenon called Bung Fai Paya Naka or ‘Naka Fireball’. It’s a visual spectacle steeped in traditional folklore where fireballs appear to rise from the river and ascend into the sky. It is believed that the fireballs belong to the great serpent of the underwater world Phaya Nak and a festival is held each year in October to celebrate the event. You can see some images and more information here. 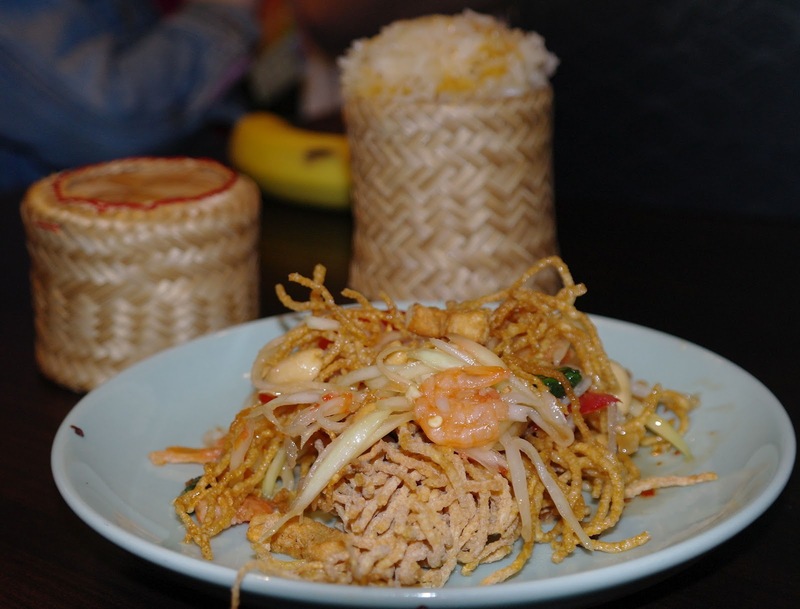 Mae Khong is the sister restaurant of another popular Victoria Street Thai establishment Tom Toon and is affectionately referred to by some as Tom Toon Too. I haven’t yet dined at Tom Toon so I can’t give a comparison of the two. Our two very friendly hosts and part owners khun Jeab and khun Khem explained that Mae Khong has mostly the same menu as Tom Toon with additional seafood specialty dishes that reflect the Isan background of the group of four owners. To start things off we sampled a selection of delicious dishes from the Mae Khong appetizers starting with the Chicken Satay (Sateh Gai). I can vividly remember the first time I tasted satay way back at Expo 88 in Brisbane. Coming from a fairly sheltered food background in North Queensland it rocked my world! In those days the closest we came to international cuisine was our regular visit to the Sun Doo or Hong Kong Chinese restaurants for the standard order of Lemon Chicken, Honey King Prawns, Beef Black Bean etc… You get the idea. 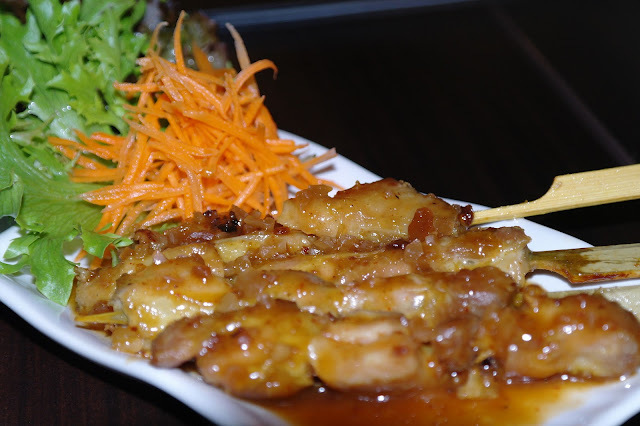 The satay chicken at Mae Khong was the Thai version, as you would expect, and much sweeter and stickier than what you find at Indonesian establishments. I love it, the Thai are so generous with their use of sugar in so many dishes and being a bit of a sugar junkie I think this is one of the reasons I love Thai food. The next offering was another of my favourites, Stuffed Calamari. 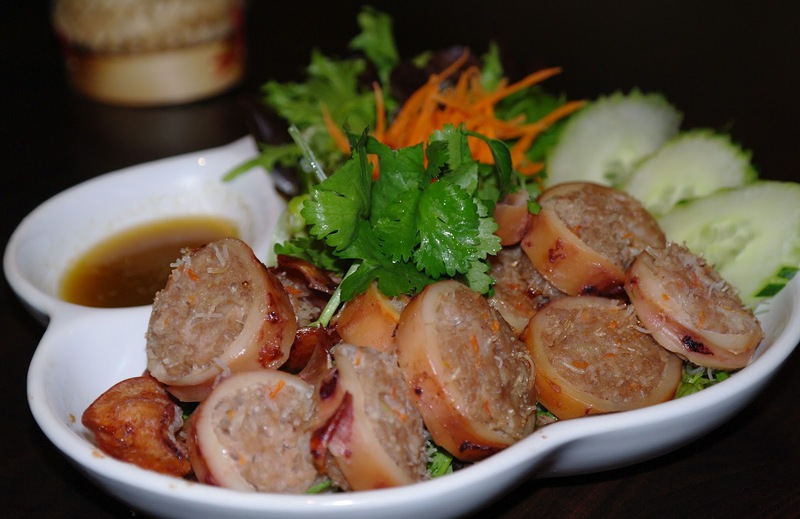 The stuffing is a mix of pork, carrot, glass noodles, lemongrass, pepper, garlic and the usual secret mix of spices. The blackened charring of the calamari is mouth-wateringly appetizing and maintaining the balance between achieving the scorched exterior while not overcooking the calamari is quite difficult to achieve. I find that the firmer texture of Thai chargrilled calamari takes a little getting used to as the flesh is not melt in the mouth tender like deep fried calamari however it certainly isn’t chewy, it’s just different. The wonderful limey salty seafood dipping sauce (Nahm Jim) is made fresh daily and really gives this dish a free kick right in front of the posts. Ribs are probably my favourite cut of chicken, and for me no visit to the Footscray Market is complete with purchasing at least a kilo. This is Mae Khong’s take on Gai Ping and it’s a great one. Gai Ping is usually cooked over charcoal but given the beautiful crunchy texture of the ribs I’m pretty sure it spent at least part of its cooking time in the deep fryer. 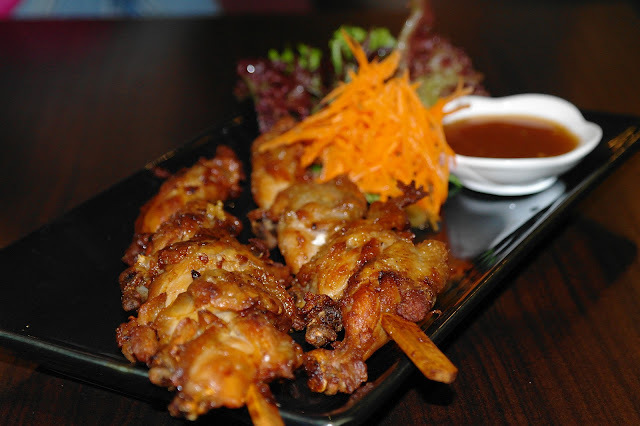 Succulent tender crispy chicken and a tamarind chilli sauce with hint of plummy sourness, just sublime. This impressive looking dish is Som Tum Mee Krob and is a Mae Khong specialty that I’ve never seen nor heard of previously. Khun Khem proudly informed me that Mae Khong chef and part owner khun Chuma is a past winner of a best som tum competition back in Thailand. I’m not sure if the award was for this particular variation of som tum but if I were a judge in such a competition this dish would be very difficult to go past for the top honour. I loved the flavours but also loved the creativity of combining crispy fried rice noodles with the crunchy fresh green papaya. The usual som tum suspects were also present, chewy dried prawns, acidic tomato, cashews, snake beans and Mae Khong’s specially made and very popular fried pork crisps (Khaep Moo) which make a decadent salty snack and are also available for take-away. Som tum is traditionally served with sticky rice (Khao Niaw) which is eaten by pinching small clumps in the fingertips and rolling it into little balls them dipping the chewy clumps into the som tam dressing. Mae Khong serve their own special version that was imparted with an earthy nuttiness thanks once again to the addition of secret ingredients. The next two dishes are where things got very exciting for me. 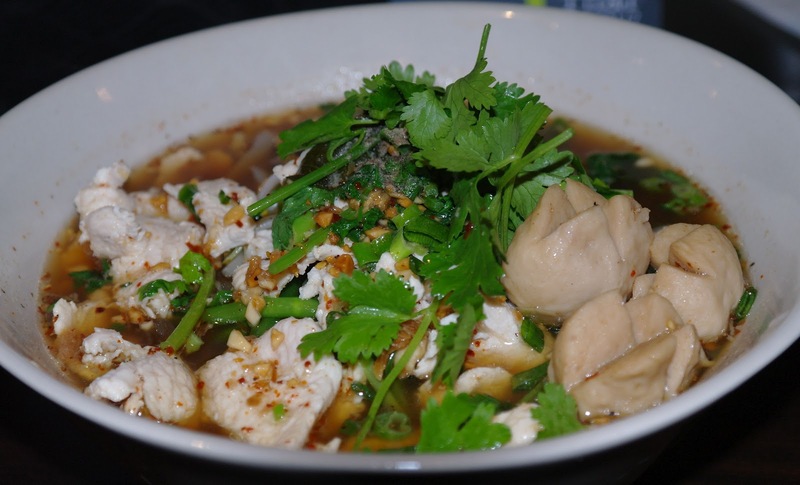 I am obsessed with Thai noodle soups, to me they are something of an enigma. The powerfully flavoured clear broths just send my taste buds into a dizzying frenzy. Spooning a mouthful of the exotic elixir triggers a heavenly sensation where my eyes involuntarily close and my head rolls back in rapture. The first of the two masterpieces of Thai cuisine that I sampled that evening was Guay Jub Moo. The magnificent pork broth is complemented by tender stewed pieces of fatty pork chops, sliced fish cake (Luk Chin Pla), morning glory (Pak Boong) and boiled quail eggs that when bitten burst their creamy yolk and send this dish to another dimension. Yes, I really loved this dish but I am completely mad for Thai noodle soups and this was easily one of the best I have enjoyed in Melbourne. 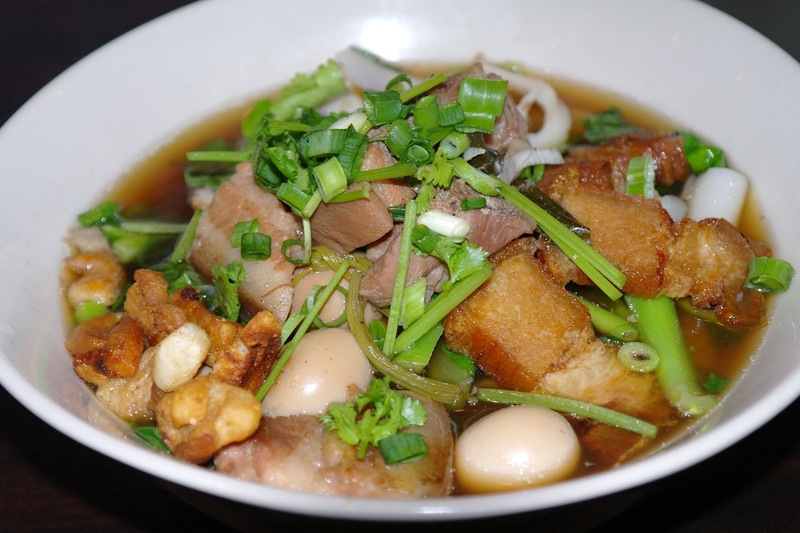 Guay Jab is typically eaten for breakfast in Thailand and traditionally it also contains various kinds of offal. OK now I love a noodle soup and like to think of myself as a food traditionalist but offal for breakfast, even I have to draw the line at that one! Thankfully the Mae Khong version didn’t contain any of those suspicious looking giblets. 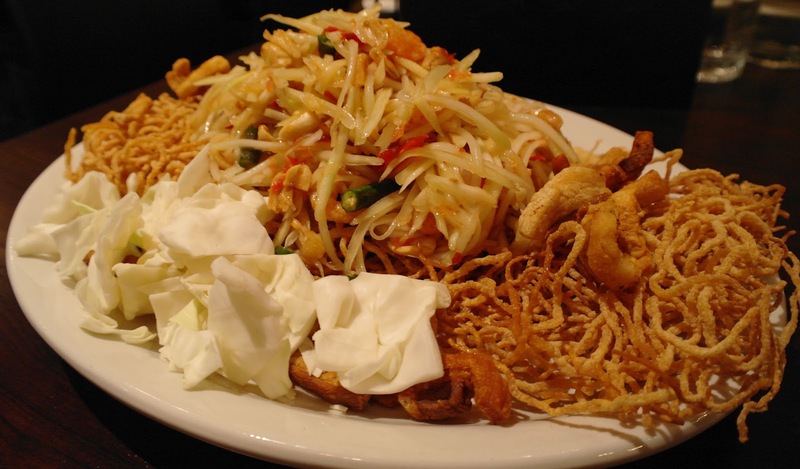 Another point of interest with Guay Jub is the use of curly flat rice noodles. This was yet another ingredient I’d never seen or read about before, yes the whole evening was quite a learning experience for me and I loved it! The noodles were texturally quite different with a buttery creaminess unlike any rice noodles I’ve previously eaten. I don’t remember seeing this dish on any Thai menu in Melbourne and for that reason alone it is worth the visit to Mae Khong. I thought that the amazing Guaj Jub was going to be a hard act to follow and was tempering my expectations so as not to unfairly judge the next dish. I needn’t have bothered. Up next was Kuay Tiau Gai which immediately took up where the Guay Jub left off. This time the broth was chicken based and equally sublime with notes of cinnamon and five spice. Khun Khem advised me that the soup had already been seasoned by the chef and no further additions were necessary. The Thai custom as I understand it is to use a circle of seasonings (Kreuang Puang) consisting of fish sauce (Nahm Pla), chilli flakes (Prik Pom), chillies in vinegar (Prik Dong) and white sugar to season their noodle soups to each individual's personal taste in a similar way to the western use of salt and pepper. After the fantastic experience to that point I was more than willing to eat as instructed and did not attempt to adjust my broth with any seasonings. In addition to the perfectly seasoned chicken broth, further flavour was delivered by shredded chicken and spongy chicken balls. In Thailand most soup noodle vendors will allow you to select your preference of noodles from thin vermicelli rice noodles (Sen Mee), medium rice noodles as used in Pad Thai (Sen Lek), wide rice noodles as used in Pad See Euw (Sen Yai) or my personal favourite thin egg noodles (Bamee). Chef Chuma selected sen lek for this dish which is not what I normally choose but once again I was more than happy with his decision. I rarely fault Thai food and my rating scale usually starts with ‘ok’ at the lower end and then heads north from there and I have been pretty open about the bias induced by my love of Thai noodle soups but I have to rate both these dishes as absolutely outstanding! Even more exciting is that Mae Khong also serve an Egg Noodle Soup with Duck (Kuay Tiau Ped Bamee) that I will be returning for very soon. By this stage we were completely full but out of some kind of extreme hospitality that khun Khem insisted was the Thai way she appeared with yet another dish! And not just any dish, a whole deep fried Barramundi served with a mint and coriander salad (Pla Yum). I had joked to friends that this reviewing game was a tough job and at that point I felt like I was literally eating my words! The deep fried fish was cooked in what I have come to accept as the Thai style, meaning that it was cooked until quite crispy which leaves the flesh not as moist as you typically expect. I’ve become accustomed to this style of preparation and have learned to enjoy the crunchiness of the fried skin and find that the dipping sauce imparts a moistness that offsets the slight dryness of the flesh. The accompanying salad is wonderfully Thai with freshness delivered by the aromatic herbs and a wonderful lingering flavour imbued by the lime, chilli and fish sauce dressing. Khun Khem is a wonderful host who I felt really treats her customers like they were guests in her own home. I witnessed her friendly affable interactions with other tables as well as our own. She is very hospitable but also very persuasive, although given our weakness for Thai desserts her rebuff of our somewhat half-hearted calls for ‘no more please’ was not completely her fault. 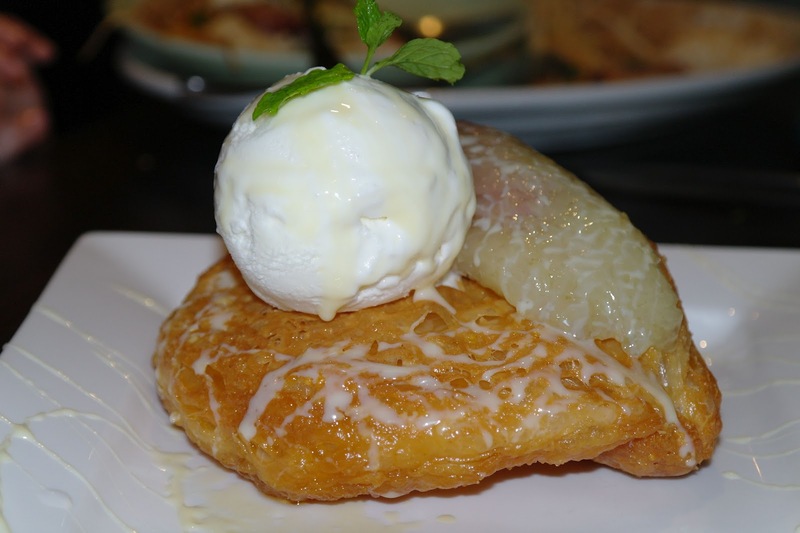 After her cheeky offer of ‘just one more small dessert’ we succumbed and were brought a delicious creation of Deep Fried Pastry with Banana Dumplings (Khao Tom Mud) and Ice Cream drizzled in sweet condensed milk. Like our dining experience that evening, this post seems like it has gone on and on so I will attempt to wrap it up. The dessert was excellent, not too heavy with a myriad of textures ranging from chewy to crunchy to creamy, just wonderful! I particularly liked the banana dumping and if you have never tried the Thai preparation of banana with sticky rice I strongly suggest that you remedy that omission. In conclusion, I’ll keep it brief. If you love authentic Thai food get to Mae Khong at your first opportunity, I’m very sure you won’t be disappointed. Awesome looking tucker there! I'd be happy to subscribe to thailiciouz, so can you please tell your pals there that not everyone has a mobile phone? The amount of info they demand is a little bit too grabby for my liking. Thanks for the feedback Kenny, I will pass it on and keep you updated. Kenny, you should be able to just put 'n/a' for your mobile and still complete the registration. Please let me know if this doesn't work for you. What a spread! So many interesting dishes there that I've never heard of, let alone seen on a Thai restaurant menu in Melbourne. actually mekong might just lose their identity due to their horrible bowls of pho and this might take over. I haven't been there yet but I will. Any recommendations for us to order? You can also drop us a line.